A big thank you to everyone who came along to our Scrufts dog show. 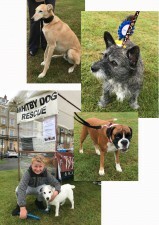 The rain did not stop all the dogs having a great time and we are very grateful for your support. Here's a few photos of the delightful dogs - Patch the gorgeous white terrier is our oldest contestant - he will be 20 this October and has been coming to our shows ever since we started 10 years ago. Casper, this years best in show is a majestic laid back lurcher with stunning wise eyes, Tilly the boxer with a tail that never stops wagging and Bertie the cutest little wire haired terrier. We had a great day raising funds for the dog rescue on Saturday- we are very grateful to everyone who came to our stall and made it such a great day. A big thank you to all our Goth friends who may the day very special.